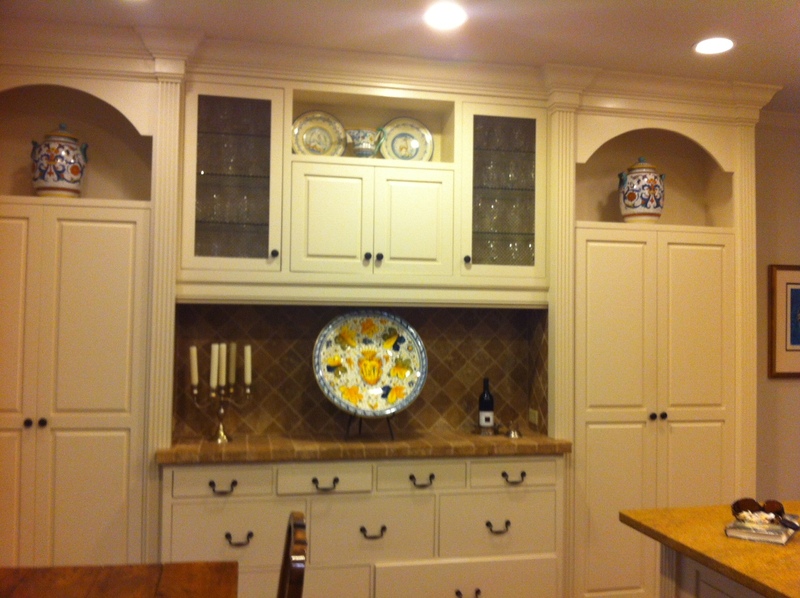 It’s always great to see how our customers’ homes look with the furniture they have purchased from us. Heidi’s chic dining room featuring our Madrid dining chairs is no exception! As you can guess from the name, the Madrid dining chairs are influenced by traditional Spanish styling. The silhouette of the chair back and the turned spindle shaping of the front legs and stretcher help create the mood. 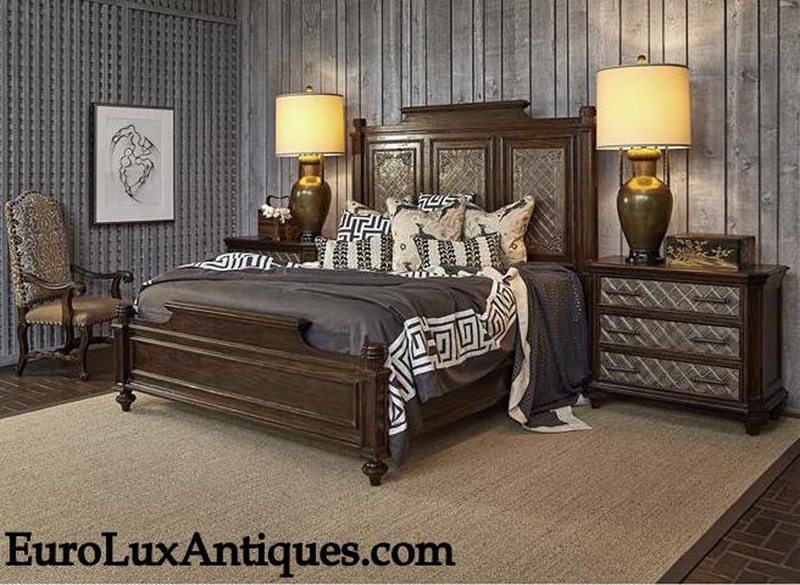 A bold nailhead trim around the linen upholstery adds another authentic touch. The Madrid dining chairs are a perfect match for Spanish Mission style decor. The Madrid dining chairs look amazing in Heidi’s home. The dining room continues that Old World Spanish feel with the big spiral candlesticks and a standing cross on the sideboard. Large glass pendant lights hung by chunky chains from the ceiling are a lovely feature too. The two lights are perfectly proportioned. They have enough heft to balance the substance of the dining table and chairs while also creating an alluringly luminous glow. The neutral linen fabric on the Madrid dining chairs pairs beautifully with the pale patterned carpet, and I think the nailhead trim on the chairs is one of those subtle details that helps pull the whole look together. Just delightful! I bet Heidi and her husband are wonderful hosts and I can only imagine the festive dinner parties that take place in this inviting setting. I’m picturing tapas and a nice Spanish wine to continue the Old World flavor, but honestly I’d say yes to pizza and juice too! 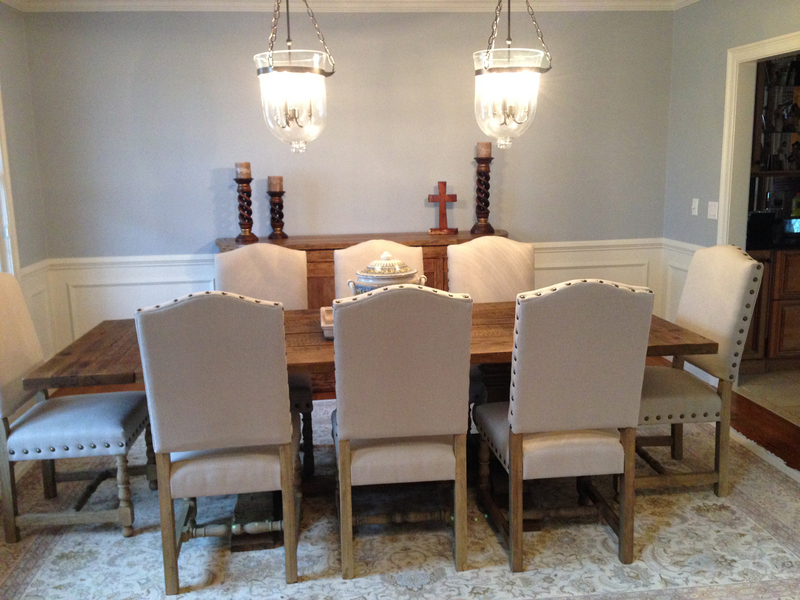 Thanks to Heidi for sharing this photo of her new Madrid dining chairs. This entry was posted in Client Spotlight and tagged dining chairs, dining room, high quality reproduction furniture, home decor, interior design, Old World style, reproduction dining chair, reproduction furniture, Spanish Mission Design, Spanish style on April 22, 2014 by admin. There are so many books coming out about vintage crafts. Old-fashioned skills like quilting, embroidery, crochet, and knitting are popular partly because they offer a way to create personalized items to wear or to enjoy in our decor. But also it’s just lovely to give a hand-made gift and to create heirlooms to pass down through the family. 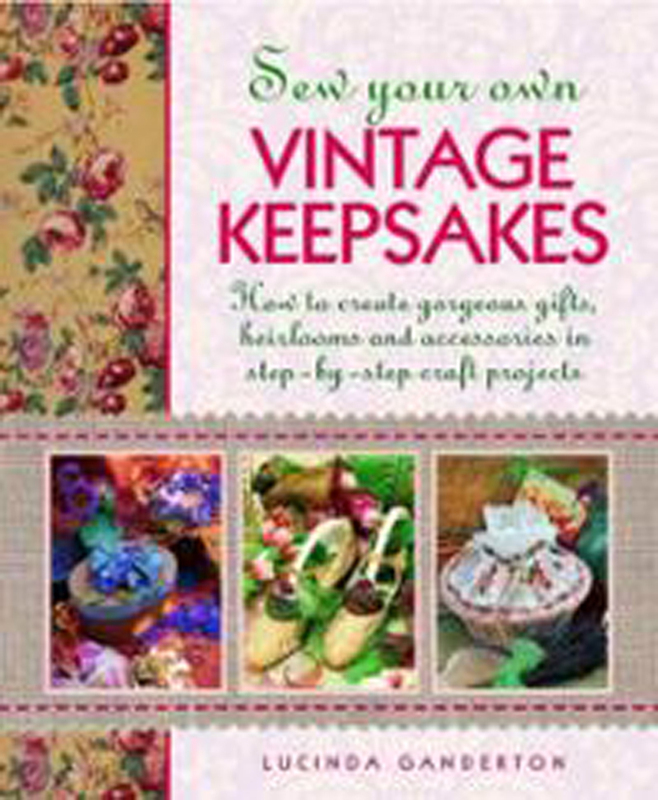 These recently published vintage crafts books provide both inspiration and practical advice! Is there anything cozier and more inviting than a beautiful quilt? 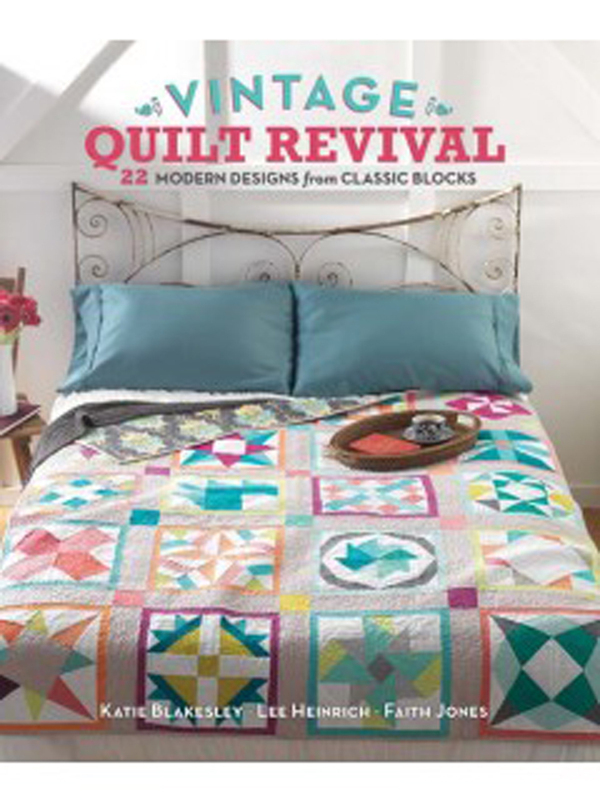 Giving a fresh twist on tradition, this new Vintage Quilt Revival book is subtitled 22 Modern Designs from Classic Blocks. As well as bed quilts, the projects include a table runner and a bag. Patterns range from the Mayflower block to the Exploding Star, Dove at the Window, and Double Windmill. I love the romantic names! Quilting is one of those vintage crafts that seems never to go out of fashion. Crafty types can get really creative with their quilts, using fabrics and patterns to reflect their individuality and their decor. Maison Sajou is a famous haberdashery and sewing crafts store in Paris. The old shop first thread its needle in 1857 and it is still going strong supplying chic French seamstresses with fancy laces, ribbons, and embroidery silks. 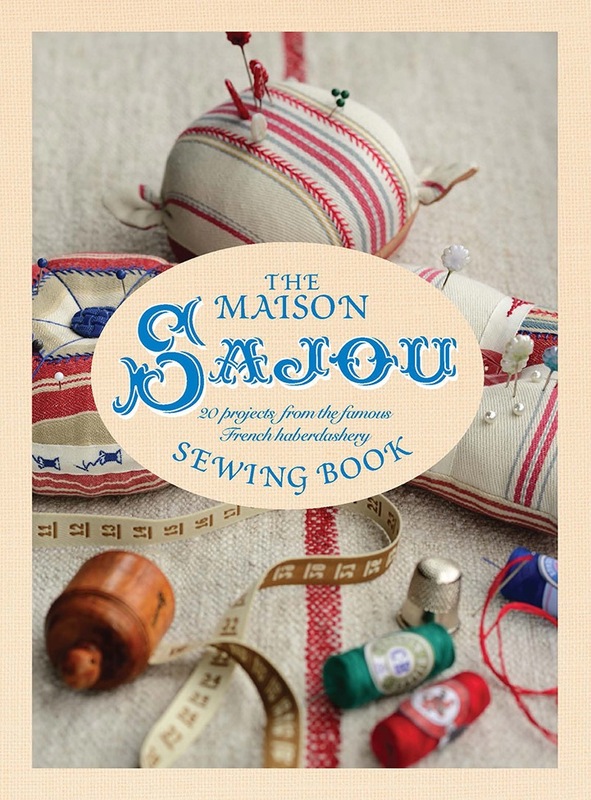 This new book describes 20 Maison Sajou projects to make at home. Ideas include decorative napkins, a vintage style clutch bag, a charming silk slipper bag, a French Country style tablecloth, a nautical tote bag, and a pulled threadwork linen bolster. You don’t have to be an expert either. The projects with illustrated instructions start with basic embroideries all the way through to more intricate concoctions. 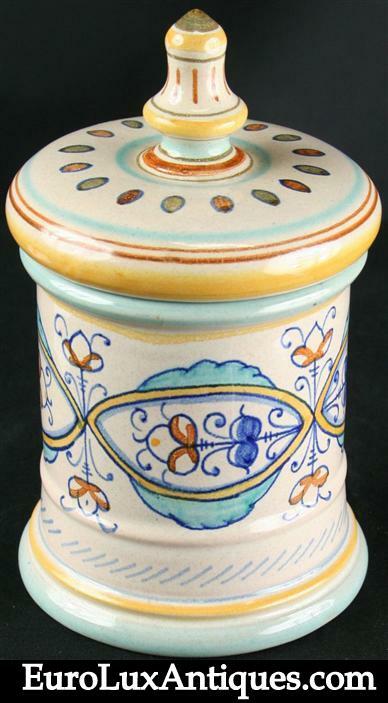 A treasure trove of ideas to make gifts, mementos and accessories that may become heirlooms! The book is heavily inspired by vintage crafts and decor and the author herself lives in an old Victorian townhouse. The 40 projects are paired with photos and step-by-step instructions to make all kinds of keepsakes from a calico doll to a christening gown, and from a drawstring bag to a fabric-lined basket. Although a reissue of an older book, this could be a keeper if you like making keepsakes! Do you knit, sew, embroider, conjure up quilts or enjoy other traditional vintage crafts? Tell us about your favorite project in the comments box below. This entry was posted in Bookshelf and tagged creative home decorating, home decor, home decor accessories, interior decor, romantic decor, vintage crafts on April 15, 2014 by admin. Gray decor is apparently rocking the trends lists for 2014. I don’t think it was ever off-trend! As April is National Decorating Month we’ve all got an excuse to rethink our interiors. Maybe even try some new and creative decorating techniques. Greg and I been working to get our drywall up in our 1920s bungalow renovation project. We also finally finished the HVAC a few weeks ago after interruptions with freak snowstorms! We’re not ready to think about finishing touches on the interiors yet. But if you plan to paint any rooms in your home, gray decor is a great way to go. Gray is the new black, according to Realtor magazine’s 10 hottest home design trends for 2014. I also remember when gray was the new brown, and then the new white. Funny how gray can’t just be the old gray that we love already! 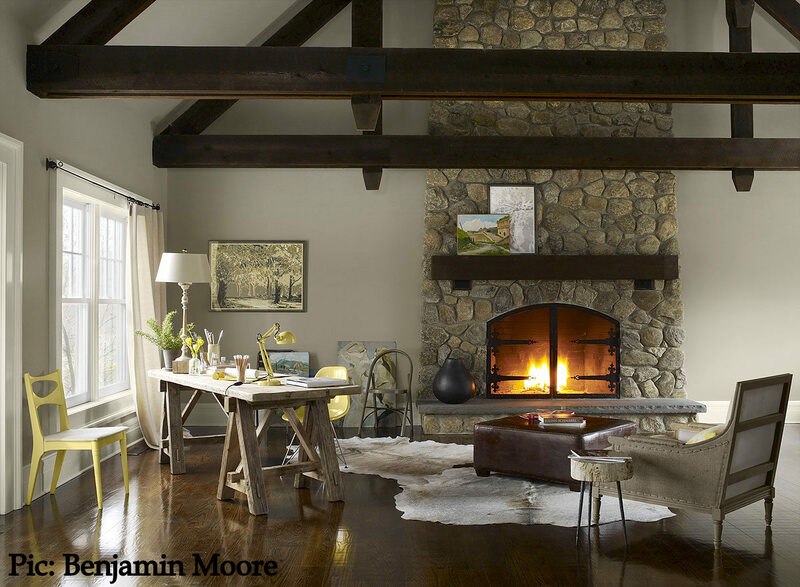 The serene living room above features Benjamin Moore‘s Thunder color paint on the walls. It shows how beautifully gray works with natural materials. It’s a perfect match for wood, stone, and natural fabrics like linen. 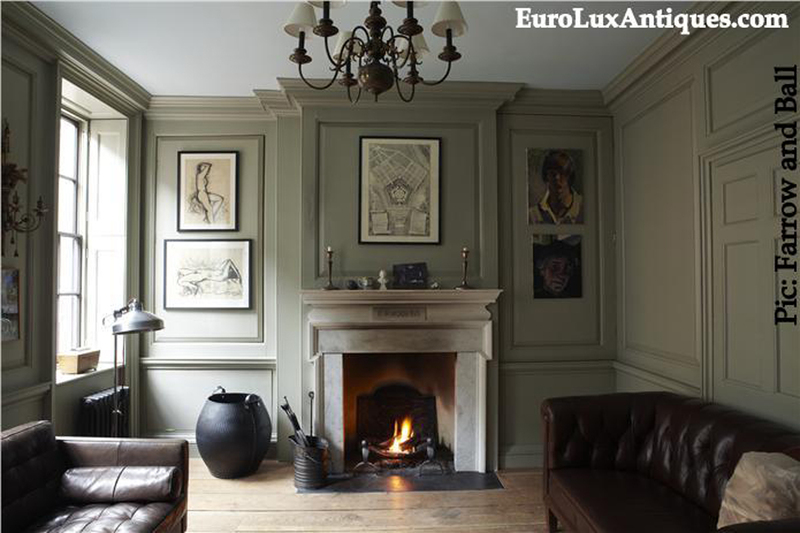 This gray decor in this classic and inviting living room is created with Farrow and Ball’s French Gray on the walls and London Stone trim. That French Gray tone was also popular in 19th century wallpapers. The Victorian style floral wallpaper in our Victorian Bed and Breakfast client spotlight is a great example.Our customers Kathy and Tim renovated a beautiful Victorian mansion in Walla Walla, Washington, and opened it as the Vine and Roses Bed & Breakfast. 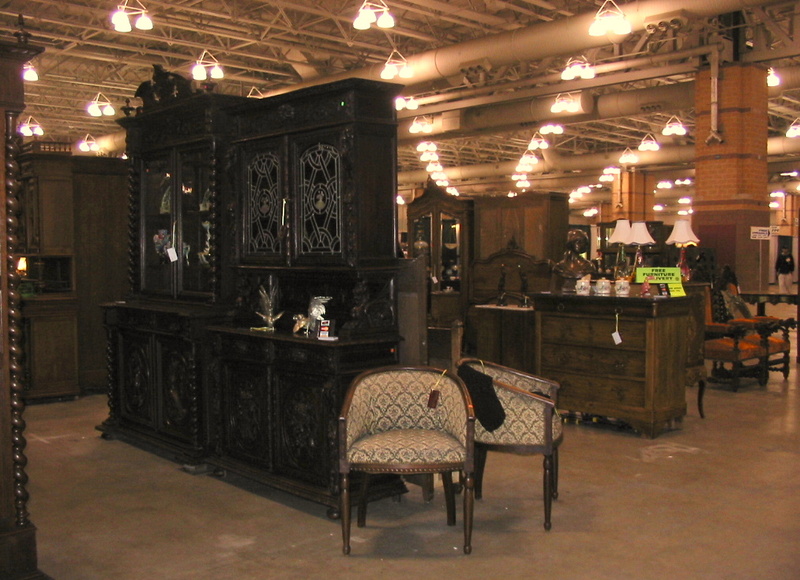 We helped them furnish it with antiques including this French Country dresser. The dresser looks fabulous against the gray wallpaper accented with vivid red flowers. In Victorian times, gray decor was also often seen in entry halls, hallways and staircases. Supposedly the simple gray wouldn’t compete with the surrounding rooms. I suspect it held its own quite well! Gray decor is sophisticated and soothing in a bedroom too. Because gray is such a subtle tone it can take a lot of texture. The textured gray walls and patterned linens in this bedroom prove the point. Anyone who worries that gray will be too staid will be reassured by this elegantly exotic room, featuring the Ambella Home Castilian king bed and chest of drawers that we stock in the gallery. If you don’t want to decorate completely in gray, a few gray accents still create the mood. 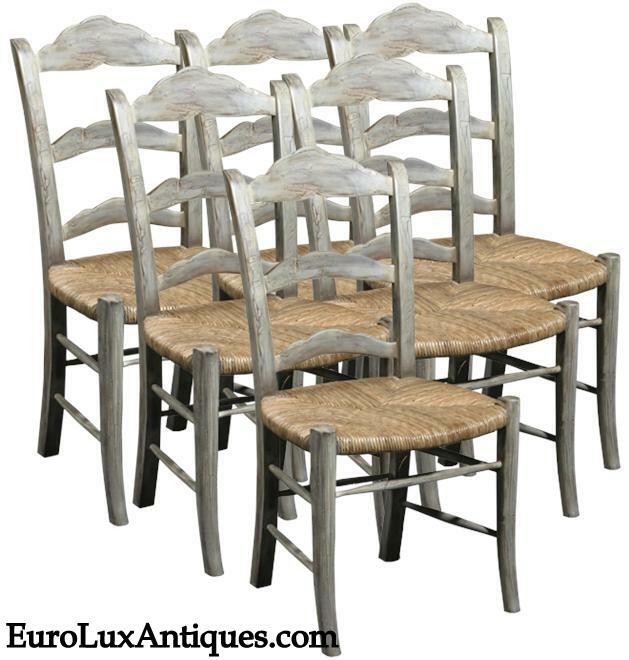 This set of 6 new French Country dining chairs looks authentically rustic, but with a nod to contemporary color. Crafted in solid mahogany, the chairs have a soft gray wash finish to make them look well-loved and well-worn. The gray complements the natural color of the handwoven rush seating perfectly. Do you have gray decor in your home? We’d love to hear what you like about it in the comments box below. This entry was posted in Home Design Ideas and tagged 2014 design trends, color, color palette, color trends, design ideas, gray decor, interior decor, interior design, neutral, neutral colors, neutrals on April 9, 2014 by admin.